Zip Dry Glue. One bottle lasts for 150-175 invitation mounts. We recommend using Zip Dry Glue for all your mounting needs. Zip Dry Glue sets in about 10 seconds to give you time to adjust, and center the piece. Only a small continuous bead (the thinnest glue line you can make) around the border of the piece is needed to be mounted. If you use to much glue it could seep through your paper & ruin your project. Practice first! When you cut the tip of the nozzle just clip enough for the smallest amount of glue to pass through. If any glue shows out from the edges, wait for it to dry, and it can simply be rubbed away with the friction of your finger tip. 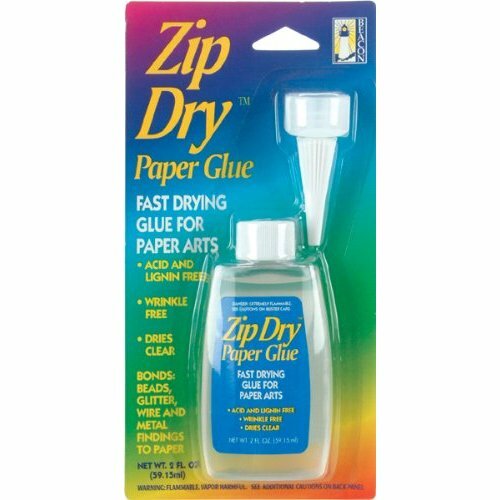 Zip Dry Glue should not crinkle or buckle the paper if the proper amount is used. Always recap your Zip-Dry Glue or it will dry up & you will have to re-cut the tip every time you use it. Ive been using this glue for years, since I sell invitations for a living. This is the best of the glues. Ive tried almost all of them selling at Michaels and Hobby Lobby and nothing like this one. The good thing that it has that if you mess up it drys quickly and then just rub it off and it will not damage the paper. The glue dries fast and really sticks well, however if you have invitations that have thermography, DO NOT USE THIS PRODUCT!! the fumes from this product ruined half of my invitations because I didn't realize that the glue's fumes would affect the text. All of the thermography raised off the invitations and ruined them. I wish I would have known this information before my deadline to send out my invitations. now I'm stuck having to use them and they are not pretty. I never scrap book or do many paper-crafts or anything, but was inspired to make my own wedding invites using materials from this site. I added this glue onto the order on a whim, and am glad I did. You really do only need to apply minimal amounts in order to get a good hold, and you have at least a good 10 seconds to shift pieces around if you didn't get them in the exact right spot. The hold is extremely secure once the glue is dry, and there really is no buckling or rippling in the paper at all. I got only one bottle, and it was more than enough. I was able to make 60 invites (mounting invitation page to pocket envelope, gluing on multiple small paper accents, mounting monogram square onto color panel, mounting that panel onto belly band, and securing the belly band) - and I only used less than 1/4 of the bottle. I recommend this glue, it was easy to work with and clean and helped make my invites look great! I ordered this glue for my DIY wedding invitations and couldn't be happier. It allows you to move the paper for a few seconds before it sticks and then dries permanently. Any excess rubs off without a trace. I'm so glad I found this! Im very happy i order this glue. i was nervous that i was going to mess up my wedding invitations, but i went on utube and saw how other poeple did it and i follow and now im glad i order this.